These six playwrights will benefit from monthly meetings with EFT’s Artistic Producer. Catherine Banks is a renowned, award-winning Canadian playwright and poet, born in Middleton, Nova Scotia. Catherine began her professional life as a Special Education teacher, and wrote plays while raising her children, Rilla and Simon, inspired by seeing a production of Les Belles-soeurs by Michel Tremblay. While resident at the Banff Centre for the Arts for 29 days, she gained a strong sense of her writing vocation. Her works include: It Is Solved By Walking, Bone Cage, Three Storey, Ocean View and Bitter Rose (which also aired on Bravo! TV’s Singular Series). Catherine received the Nova Scotia Established Artist Award in 2008 for her body of work and has won the Governor General’s Literary Award for Drama twice. Her latest work, Miss ‘n Me, will receive its Atlantic Canada premiere as part of Eastern Front’s 2018/2019 season. Ryan Griffiths is a National Theatre School trained emerging playwright. As the Artistic Director, Ryan spends his days running the Next Folding Theatre Company in Fredericton, New Brunswick. In his spare time, he manages to find time to write plays. His adaptation of Alistair MacLeod’s short story, The Boat has been produced at several theatres, while other works (Lutz; Fortune of Wolves; Kind; Shepody, Rage and Wolfe; Wharf; Returning Fire; A Brief History of the Maritimes and Everywhere Else) have been garnering attention. 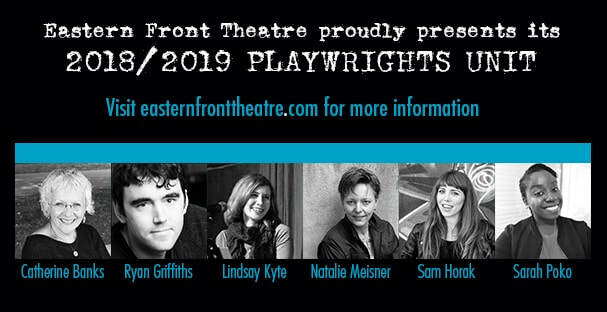 Natalie Meisner is an award winning writer, widely produced author of stage plays and an Associate Professor in the Department of English at Mount Royal University. Her book, Double Pregnant: Two Lesbians Make a Family (Fernwood) was a finalist in the Atlantic Book Awards. Her play SPEED DATING FOR SPERM DONORS was a hit in Calgary and at Neptune Theatre in Halifax. Her areas of research and teaching include theatre/drama, creative writing, Canadian literature, theories of comedy and laughter, and the history and construction of gender and sexuality. Dr. Meisner received her PhD from the University of Calgary, taught at the University of Regina and has been at Mount Royal since 2007. ​Samantha Horak is an emerging playwright, director and theatre creator. Horak is the current Artistic Director of Rolling Bold Productions an Independent theatre company producing Queer, feminist theatre with Rock N Roll styling’s. Horak is currently working on two original full-length scripts: Kitchen, a Rock Tale and Rock N Roll Saved my Life. Horak previously won the “Fringe hit” award for her Atlantic Fringe Festival production of Sit on my Face (2015) and a Bronze Medal for Sissydude, a dandy rock musical in The Coast’s “Best Of Halifax” awards (2013). When Horak isn’t creating theatre, you can find her rocking out with her Feminist Punk band, The Femdoms. Sarah Poko is a budding writer and aspiring film maker from Nigeria. From the age of two, Sarah lived in several places around the world, including South Africa, India and Switzerland which exposed her to a multitude of stories and history from different cultures. Sarah's travels and love for writing led her to pursue a career in journalism. She graduated with a Master's in Investigative Journalism from the University of King's College and has written several stories for The Coast, Polestar News, and CBC.